Today my guest is Mitch Steele who is the Brewmaster at Stone Brewing Co, and also author of the book IPA: Brewing Techniques, Recipes and the Evolution of India Pale Ale (Amazon affiliate link). He joins me this week to discuss trends in India Pale Ales – one of the fastest growing segments of the Craft Beer market. 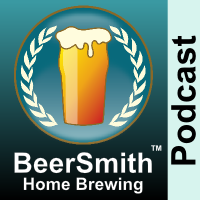 Also check out BeerSmith software, the new DVDs John Palmer and I filmed – How to Brew with Malt Extract and How to Brew All Grain are both available now. Mitch explains that IPAs have exploded the last few years and now make up nearly 40% of Stone’s sales, and almost half of their year-round releases. We discuss the history of IPAs and how they have evolved over the years – history was a large focus in Mitch’s book on IPAs. Previous post: Should you use a Secondary for Beer Brewing?